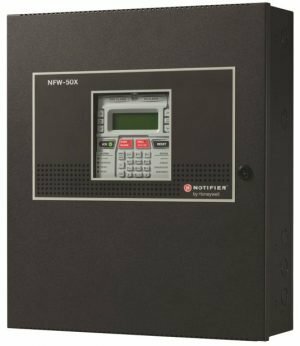 The FireWarden-100-2 is designed for applications requiring more advanced addressable intelligence, flexible programming options, and robust power supply for driving horns, strobes, and auxiliary devices. 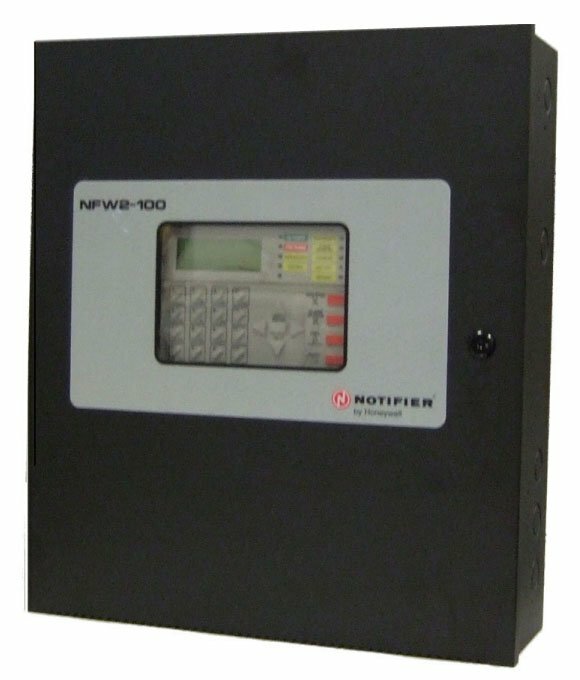 The Notifier FireWarden-100-2 Rev 2 (NFW2-100 Rev 2) with Version 4.0 firmware is a combination FACP (Fire Alarm Control Panel) and DACT (Digital Alarm Communicator/Transmitter) all on one circuit board. This compact intelligent addressable control panel has an extensive list of powerful features. The SLC (Signaling Line Circuit) of the FireWarden-100-2 Rev 2 operates using a Rapid Group Polling communication protocol technology that polls multiple devices simultaneously for a quicker device response time. This patented technology allows a fully-loaded panel with up to 198 devices to report an incident and activate the notification circuits in under 10 seconds. With this improved polling, devices can be wired on standard twisted, unshielded wire up to a distance of 10,000 feet. The FireWarden-100-2 Rev 2’s quick-remove chassis protects the electronics during construction. The backbox can be installed allowing field wiring to be pulled. When construction is completed, the electronics can be quickly installed with just two bolts. The integral DACT transmits system status (alarms, supervisories, troubles, AC loss, etc.) to a Central Station via the public switched telephone network. It also allows remote and local programming of the control panel using the PS-Tools Upload/Download utility. In addition, the control panel may be programmed or interrogated off-site via the public switched telephone network. Any personal computer with Windows® XP or greater, a compatible modem, and PS-Tools, the Upload/Download software kit, may serve as a Service Terminal. This allows download of the entire program or upload of the entire program, history file, walk-test data, current status and system voltages. The panel can also be programmed through the FACP’s keypad or via a standard PS-2 computer keyboard, which can be plugged directly into the printed circuit board. This permits easy typing of address labels and other programming information. Version 4.0 firmware supports the following: ANN-bus devices, NP-A100, USB port, NAC circuit diagnostics, a new report has been added to the walk-test that lists untested devices, new device types added: audio telephone type code for NFV-25/50ZST, Photo Supervisory and auto-resettable Drill (non-latching). Note: Unless otherwise specified, the term “FireWarden-100-2” is used in this document to refer to both the FireWarden-100-2 and the FireWarden-100-2E FACPs (Fire Alarm Control Panels). Likewise, “NFW2-100” refers to NFW2-100E as well. Remote site or local USB port upload/download, using PS-Tools. 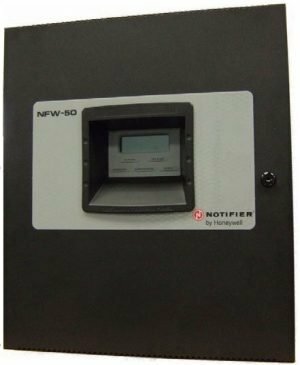 Remote Acknowledge, Silence, Reset and Drill via addressable monitor modules or FDU-80, N-ANN-80 or ACS Annunciators. 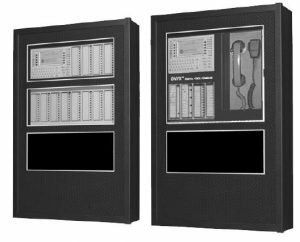 -ACS Annunciators: Up to 32 ACM Series annunciators (ACM-16AT or ACM-32 series). Cannot be used if ANNBUS devices are used. -Terminal-mode Annunciators: Up to 32 FDU-80 annunciators. EIA-232 printer/PC interface (variable baud rate) on main circuit board, for use with optional UL-listed printer PRN-6. One person audible or silent walk-test with walk-test log and printout. Waterflow (non silenceable) selection per monitor point. Four onboard NACs with additional NAC capability using output control modules (NC-100). The four Class B NACs can be converted to two Class A NACs with NACKEY (included). Note: Maximum 24 VDC system power output is shared among all NAC circuits and 24 VDC special-application auxiliary power outputs. Total available output is 3.0 amps. Using the optional XRM-24B transformer increases 24 VDC output to 6.0 amps. OFFLINE PROGRAMMING: Create the entire program in your office using a Windows®-based software package (NFW2-100 requires PS-Tools Programming software, available on VFWARDEN-CD and www.magni-fire.com). Upload/download system programming locally to the Fire-Warden-100-2(E) Rev 2 in less than one minute. USB programming with standard Male-A to Male-B cable. AC Power: FireWarden-100-2 Rev 2: 120 VAC, 60 Hz, 3.0 amps. 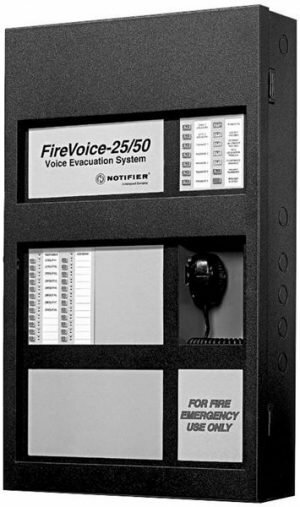 FireWarden-100-2 Rev 2(E): 240 VAC, 50 Hz, 1.5 amps. Wire size: minimum 14 AWG (2.00 mm²) with 600 V insulation. Battery: Two 12 V 18AH lead-acid batteries. Battery charger capacity: 7 – 18 AH. FireWarden-100-2 Rev 2 cabinet holds maximum of two 18 AH batteries. Notification Appliance Circuits: Each terminal block provides connections for two Style Y (Class B) or one Style Z (Class A) for a total of four Style Y (Class B) or two Style Z (Class A) NACs. Maximum signaling current per circuit: 2.5 amps. End-of-Line Resistor: 4.7K ohm, 1/2 watt (P/N 71252 UL listed) for Style Y (Class B) NAC. Refer to panel documentation and Notifier Device Compatibility Document for listed compatible devices. Two Programmable Relays and One Fixed Trouble Relay: Contact rating: 2.0 amps @ 30 VDC (resistive), 0.5 amps @ 30 VAC (resistive). Form-C relays. Special Application Power (24 VDC Nominal): Jumper selectable (JP4) for conversion to resettable power output. Up to 0.3 amps total DC current available from each output. Power-limited. Four-Wire Resettable Special Application Smoke Detector Power (24 VDC nominal): Up to 0.3 amps for powering four-wire smoke detectors. Power-limited. Refer to the Notifier Device Compatibility Document for listed compatible devices. Remote Sync Output: Remote power supply synchronization output. Nominal special application power: 24 VDC. Maximum current: 40 mA. End-of-Line Resistor: 4.7K ohm. Output linked to NAC 1 control. Supervised and power-limited. Telephone Interface: Unless used with Teldat VISORALARM, requires dedicated business telephone number with a minimum of 5 volts DC (off-hook voltage). Obtain dedicated phone line directly from your local phone company. Do not use shared phone lines or PBX (digital) type phone line extensions. Door: 19.26″ (48.92 cm) high x 16.82″ (42.73 cm) wide x 0.12″ (0.30 cm) deep. Backbox: 19.00″ (48.26 cm) high x 16.65″ (42.29 cm) wide x 5.20″ (13.34 cm) deep. Trim Ring (TR-CE-B): 22.00″ (55.88 cm) high x 19.65″ (49.91 cm) wide. Weight: 26.9 lbs. (12.20 kg.) Dimensions: 20.00″ (50.80 cm.) high x 22.5″ (57.15 cm.) wide x 8.5″ (21.59 cm.) deep. PROPRIETARY (Automatic, Manual, Waterflow and Sprinkler Supervisory). CENTRAL STATION (Automatic, Manual, Waterflow and Sprinkler Supervisory). 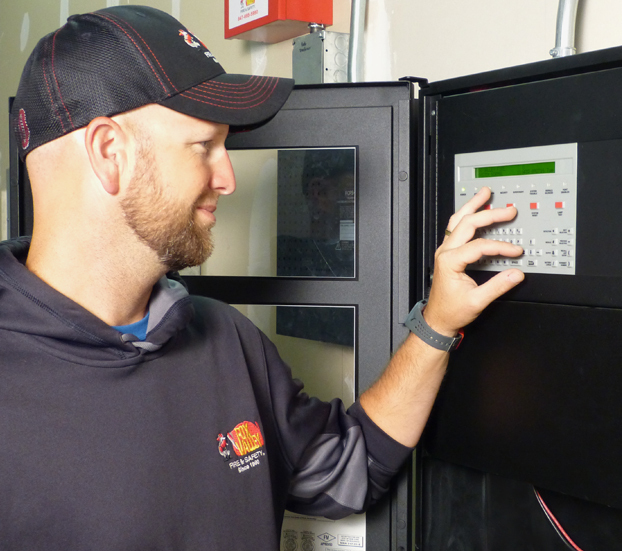 The listings and approvals below apply to the basic FireWarden-100-2 Rev 2 control panel. In some cases, certain modules may not be listed by certain approval agencies, or listing may be in process. Consult factory for latest listing status.